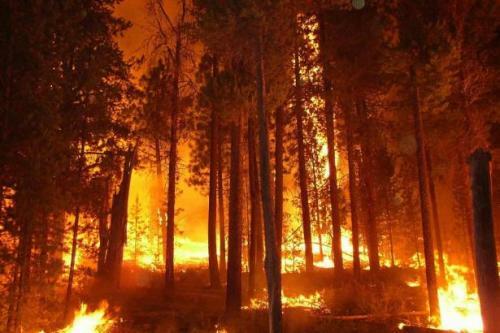 As forest fires threatened a B.C. city late last month, some churches were in the line of the fire, and others were trying to help out. Some were in both categories. Three fires broke out on the west side of Okanagan Lake on the weekend of July 18-19. They quickly became major threats, fanned by high winds and tinder-dry conditions. Soon an estimated 11,000 people had been evacuated from their homes. The Glenrosa fire started first, on the edge of West Kelowna (formerly called Westbank), and immediately became a threat to homes and businesses. Because it was nearby, fire crews and other emergency personnel began using the parking lot of Emmanuel Church as a staging area on July 18. However, when the fire jumped Highway 97 and began approaching the church, fire crews evacuated the area. Church staff quickly removed computers and other vital documents from the building and also left – but not before church bookkeeper Marlene Beagle snapped some impressive photos of the approaching wall of fire. Church services were cancelled for July 19. When senior pastor Derrick Hamre was interviewed on radio that Sunday morning, he encouraged church members to gather together, to pray, to volunteer and to help the community. With calmer winds and aggressive firefighting on July 19 and 20, the church and all but three homes were saved from the flames, although some others suffered damage. The Rose Valley Fire was proving somewhat harder to fight due to the difficult terrain, but was a little farther away and not considered an immediate threat to houses. What became the largest fire, on Turtle Mountain, was even farther away. Meanwhile, Emmanuel Church staff worked hard to keep in touch with the congregation and connect evacuated church members with families who could offer billeting. Hamre and his wife Sara-Lee had five people staying with them, even though their house was also on evacuation alert – meaning they could be told to evacuate at a moment’s notice. Several other churches were also closed on the Sunday, including some not in the official evacuation area. Redeemer Lutheran Church decided not to hold its regular Sunday service for a variety of reasons: about half the congregation had been evacuated from their homes; some roads were closed, and people were being asked to avoid travelling on others to keep them clear for emergency vehicles. Smoke was also an issue. Some members of the church offered their homes for billeting. With the service cancelled, extra work was required to pull church members together to prepare for a vacation Bible school, scheduled for the week of July 27-31. On its church sign, the church posted these words: “Lord protect, save, heal, comfort in Jesus’ name.” Pastor Jonathan Asmus said it was both a prayer to God, and a witness to the community. Churches not affected by the fires offered help in large and small ways. Members of St. George’s Anglican Church made and took sandwiches to an emergency registration centre every day, from the first day the fires began. The Salvation Army provided more than 2,000 meals to displaced residents, firefighters and other emergency staff and volunteers in the first weekend. They had additional service vehicles and volunteers on call, in case the fires continued to spread. Members of many churches offered to billet evacuees in their homes, and the offers exceeded the need. Many evacuees had gone to stay with friends or family. Others just jumped into their RVs and drove them down to the WalMart parking lot or various campgrounds. Circle Square Ranch, a Christian camp about an hour north in Armstrong, had some vacancies for the week of July 19-25, so director Dwayne Boyd phoned churches and the evacuation centre in the affected area, offering a free week of camp to any evacuated children. The fires did not affect the larger city of Kelowna on the east side of Okanagan Lake; but the fires stirred memories of 2003, when similar fires there destroyed hundreds of homes and drove thousands of people into evacuation centres. Kelowna Christian Centre began collecting and delivering bedding to the main evacuation centre in West Kelowna on the evening of July 18 – and offered other help which, at press time, had not been needed. Trinity Baptist Church in Kelowna provided emergency lodging to evacuees, and hosted a public meeting for people who had lost their homes in 2003. Trinity is still listed as a possible emergency lodging or reception centre with Emergency Social Services (ESS), but Kelowna is in a different disaster response area than West Kelowna, and designated centres there will be used only if the centres in West Kelowna are themselves evacuated or become overcrowded. Trinity has offered ESS a variety of help, including prayer. ESS responded by asking for prayer. Prayers have been answered. By Tuesday, July 21, the Glenrosa fire was 60 percent contained; and 6,000 of the 11,000 evacuees were allowed back home, while still being kept on alert for another evacuation. Emmanuel Church was reopened. This does not mean churches are relaxing their efforts. One thing they have learned from previous fires is that “it’s not done till it’s done,” said Candace Giesbrecht, pastor of compassion and mission ministries at Trinity Baptist. One big wind going the wrong way, or a thunderstorm with lightning strikes, could quickly reignite the recent fires or start new ones. Even when the fires are over, they leave a lot of devastation and trauma behind them. “We know we still have a lot of work and opportunity ahead of us,” Giesbrecht said. She encouraged churches in other communities to look at their resources and talk to city officials about what they have to offer their communities – because disasters can strike without warning.